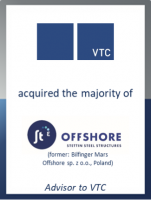 GCA Altium acted as debt adviser to VTC Group on the acquisition of a majority stake in Bilfinger Mars Offshore sp. z o.o., Poland. As part of its strategic repositioning, Bilfinger group decided to sell its activities relating to the manufacturing of offshore foundations. The joint venture Bilfinger Mars Offshore sp. z o.o., Poland, manufactures steel foundations for offshore wind turbines in the Polish city of Szczecin. While the Polish investment fund Mars remains invested in the joint venture with ownership of a 37.5 percent stake, Bilfinger has sold its 62.5 percent stake. The shares were acquired by Munich-based VTC Group, which generates consolidated annual sales of more than €600 million with 3,300 employees worldwide, through its portfolio company Europoles Renewables GmbH. Going forward Bilfinger Mars Offshore will trade under the new name ST³ Offshore sp. z o.o. GCA Altium advised VTC Group on raising a bonding facility which was placed in the bank and insurance sector. The new facility will be used to support the operations and to ensure the future growth of ST³ Offshore. ST³ Offshore produces jackets, monopiles, transition pieces and other steel structures using the latest serial production techniques. The serial production process reduces costs and waste, increases production rates, ensures high quality and, importantly, allows a systematic approach to managing and improving site safety. Established in 2012, the construction plant was built over the following years with full operations starting mid-2015.